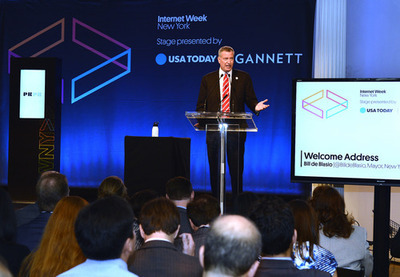 New York City can surpass Silicon Valley as the country’s tech hub, Mayor Bill de Blasio told 300 attendees at the 19th annual Internet Week New York last week. In his first speech to Gotham’s tech community, he outlined the city’s plans to dedicate $10 million dollars to keep top talent in the city and cultivate home-grown talent, starting in middle-school. The four-day conference, presented by Made In New York and Crain’s, with co-sponsors including Yahoo, She Knows and the Wall Street Journal, offered over 100 panel discussions. They covered the gamut from what women need to understand when they are raising funds in a male-dominated tech industry, to how a hashtag can incite true activism. Below, the 10 most interesting things I learned while there. Payphones will be turned into internet hotspots, enabling New Yorkers to power up and stay connected. And a Harlem Wifi Network will be the largest, free public Wifi hub in the nation. Start-Up NY is a fairly new program run by the city in connection with State Universities of New York (SUNY), which offers tax-free space on SUNY college campuses for 10 years to entrepreneurs (start-ups and expanding businesses). Check http://www.startup.ny.gov for more information and to see if you qualify. “If you want a great meeting, be more man-like. If you cannot, bring a man. Have him dress nice, but don’t talk,” said Kathyrn Minshew, founder and CEO TheMuse.com. The hashtag #BringBackOurGirls sparked international awareness of the 300 young girls kidnapped in Nigeria in part because the Tweet turned into a mobilized action, explained Christen Brandt. She co-founded the not-for-profit She’s the First with NYWICI member and scholarship winner Tammy Tibbetts.